Traveling into the backcountry clears the mind, creates peace, and re-focuses everything to the here and now. With thoughts focused on comfort, warmth, survival, and hopefully the beauty surrounding you, your mind tends to forget about the zillion things you should be doing at home. That meeting you have at work bright and early Monday morning – forgotten. The fight you had with your teenager, spouse, sister, friend, mother… – forgotten.The list of chores waiting for you at home – forgotten. The ten million things you should be doing right now at work, home, school – forgotten. It is all forgotten. Children also benefit from the opportunity to clear their minds from the pressure of balancing school, friendships, family, and extracurricular activities. Take a weekend backpacking trip with your family and suddenly you get to spend two or three whole days together in uninterrupted time reconnecting. You cook together, sleep together in the same room or cabin, and you must actually talk to one another with no TV to provide diversion. This is something that we all benefit from year round. For some of you, getting into the backcountry year round might not be much of a challenge if you live in one of the southern US states. For my family in the Canadian Rockies though, we have to take winter seriously because the temperature can drop to -20 F (or colder.) How do you go camping or backpacking when the snow is waist deep and how do you stay warm in a tent when it’s -20? For us, the answer is that we choose not to camp or tent during the winter months. We look for comfortable cabins, shelters, and huts equipped with propane heaters or wood stoves. We stay in wilderness hostels located in remote destinations, and sometimes we even travel to backcountry lodges where we can be pampered while enjoying our wilderness experience. Regardless of where you live, backcountry “camping” and travel is possible as a family year round with a bit of creativity. Below are our favourite ways to introduce children to this incredible experience – snow and all. The Alpine Club of Canada restored the old Cameron Lake warden cabin and turned it into the comfortable cabin that we stayed at over the Christmas holidays this past year. The cabin sleeps 8 people, perfect for two families to share, but the best thing about this cabin is that it’s accessed via a very short 1.2 mile hike or ski on a well maintained summer road that is relatively flat for the entire distance. Families have been visiting this new cabin since December of 2015 when it first opened to the public and some of the youngest campers have been under 6 months old. Pulled in to the cabin in sleds, these babies have no idea how lucky they are to be getting such an early start on their backcountry adventures. We skied into Cameron Lake since the road is groomed and track set for cross country skiing, but friends snowshoed in with both experiences enjoyable and easy. We brought our snowshoes with us and enjoyed hiking to nearby Akamina Lake and Cameron Lake. We hope to return next winter for a longer snowshoe hike up to Akamina Pass on the border with British Columbia. The Cameron Lake Cabin is open from December 1st through the end of April each year for winter travel only. To make a reservation please visit the Alpine Club of Canada website. Members of the Alpine Club can make reservations a year in advance of their intended stay and you don’t have to be a Canadian resident to become a member. Non-members can book a month in advance. The Elk Lakes Cabin – Located in Elk Lakes Provincial Park, British Columbia. This cabin is accessed via a 5.6 mile hike or ski from Peter Lougheed Provincial Park in Kananaskis, Alberta. The trail follows the groomed Peter Lougheed ski trail system for the first couple of miles and then enters more “Backcountry” terrain for the second half of the journey where I always appreciate having snowshoes for easier travel. The cabin sleeps 14 people and can be booked a year in advance by both members and non-members of the Alpine Club. Consider planning a trip to the City of Calgary over Easter or another big holiday and take a trip into Elk Lakes while here. The Elizabeth Parker Hut – Located in Yoho National Park, British Columbia. This cabin is accessed via a 7.5 mile hike or ski on a well maintained summer road (closed to vehicles in winter) that is easy to follow. Most people prefer to ski the road and bring snowshoes for exploring the backcountry terrain from the hut. The hut sleeps 20 people in winter and can be booked a year in advance by members of the Alpine Club. Non-members can book a month ahead. Consider planning a trip to Calgary over the Christmas holidays this coming year and take a multi-day trip into the Elizabeth Parker Hut. The hut is also popular over Easter and Spring Break. The A.O. Wheeler Hut – Located in Glacier National Park, British Columbia. Note that this is the Canadian Glacier National Park and not the American park that shares a border with Southern Alberta. The Wheeler Hut is accessed via a very short 0.7 mile hike or ski. 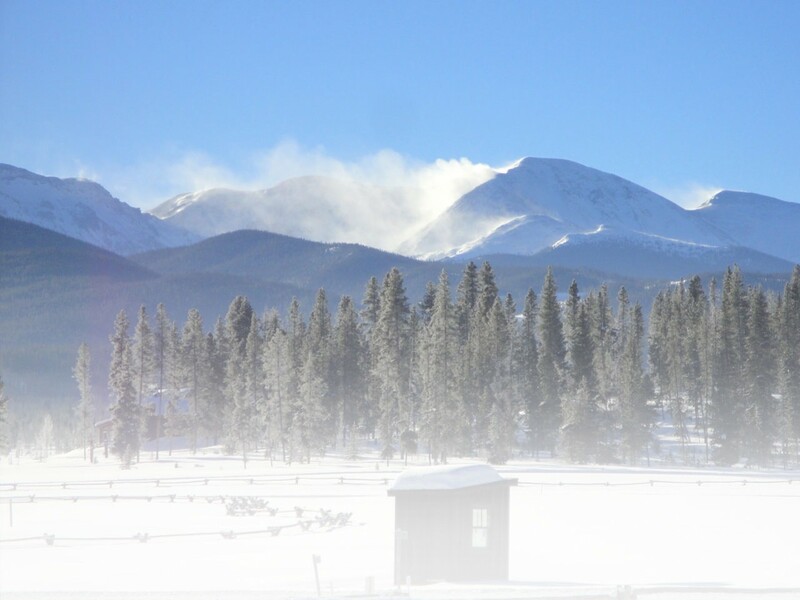 It is very popular in the winter with backcountry skiers but families will enjoy snowshoeing near the hut and playing in the deep powder that makes this hut famous across the Rockies. The hut sleeps 24 people in the winter and is one of the largest cabins that you will find in the Alpine Club collection with two floors and three rooms on the main floor. It can be booked a year in advance by members of the Alpine Club or a month ahead by non-members. Consider planning an early season trip here over American Thanksgiving or over Canadian Remembrance Day in November. The snow falls early in this valley and it’s a great spot to visit when you are looking for pre-Christmas powder. For more on this hut, please read my recent story for Snowshoe Magazine: Snowshoeing Rogers Pass in Glacier National Park, Canada. Note that when booking huts with the Alpine Club of Canada, you don’t have to book the entire cabin. You book as many beds as you’d like to reserve. Children are more than welcome at all huts but know that you will be sharing a room with other users so we usually try to recruit other families to travel with, preferring to make an exclusive booking. We love staying at Wilderness hostels with Hosteling International and find that this gives us a taste of being in a remote wilderness setting without having to trek too far from our vehicle. Our favourite wilderness hostel in the Canadian Rockies is the HI Hilda Creek Hostel located on the Icefields Parkway between the towns of Lake Louise, Banff National Park and Jasper in Jasper National Park. It’s a short 5 minute walk into the hostel off the highway (bring snowshoes for the deep snow) and you’ll have the entire cabin to yourself if you book all 6 beds. From the hostel, you can step outside your door and go snowshoeing up to the glacier moraines above. The kids will be able to tell their friends about how they went winter camping in Banff National Park, of how they built snow caves, hiked to an ice cave at the base of the Athabasca Glacier, and went sledding on glacier moraines. Guaranteed 90% of their friends won’t even know what a moraine is and a large portion will have never seen a glacier outside of a story book or movie. Winter camping skills are required for all stays at Hilda Creek in winter. You’ll be responsible for getting the propane stove turned on and working, for collecting creek water to boil and drink (or of melting snow if the creek is frozen,) and for all emergency situations that should arise. There is no manager on site and this hostel is essentially a backcountry cabin with a 5 minute approach. For more information on this hostel please read my previous stories for Snowshoe Magazine: Spring Adventures on Alberta’s Icefields Parkway, and It’s still Snowshoe Season in the Canadian Rockies. You can tell from these stories that we like to stay here in the spring when days are warm and sunny, and when we are still trying to find late season snow to play in. Easter is always a favourite time to visit the Icefields Parkway. For information on other wilderness hostels in the Canadian Rockies with Hosteling International please read my previous story for Snowshoe Magazine: Family Wilderness Getaways in Banff National Park and visit the Hosteling International website. Many wilderness hostels have on site managers and a few even boast of indoor plumbing and electricity. Regardless of where you stay though, backcountry opportunities are plentiful as soon as you step outside the hostel door. If you want to travel into the backcountry but you require a few more comforts, you may want to look into staying at a backcountry lodge in Banff National Park. Both Skoki Lodge and Shadow Lake Lodge provide all meals along with comfortable accommodations while you relax from your hike in. There’s no cooking or cleaning required during your stay and you won’t be melting snow for drinking water. Skoki Lodge is accessed via a 6.8 mile hike or ski from Lake Louise through pristine backcountry Banff National Park. Shadow Lake Lodge, also located in Banff, is accessed via an 8.7 mile hike or ski on an old fire road that’s easy to follow. Many people prefer to ski into Shadow Lake but once you arrive at the lodge, there is great hiking around the area for snowshoers to enjoy. Both lodges offer an unforgettable stay with private cabins available at both. Children are welcome at both and strong skiers or hikers would be able to tow younger children into either lodge with a ski pulk or Chariot on skis. To read about my family’s recent trip into Shadow Lake, please read my story: My Quest to Find the Most Beautiful Destination in Backcountry Banff National Park. To read about my recent trip into Skoki Lodge, please read my story: In Search of the Ultimate Backcountry Ski Lodge – on Snowshoes. For those looking to find something a bit closer to home, here are some other options for cabins, huts, and hostels in the United States. This entry was posted in Destinations, First Timers, Homepage Featured, Women by Tanya Koob. Bookmark the permalink.